Lexus has finally unveiled the highly anticipated LFA Luxury Sports Coupe to the media at the 2009 Tokyo Auto Show. The details of this vehicle are nothing short of breathtaking, starting with the price, $375,000 USD. Power for the LFA comes from a unique to the LFA, 4.8L 40 valve V10 engine that sports Titanium valves, ultra–light weight rocker arms with a diamond–like coating with a fully integrated lower crankcase that reduces pumping losses at high RPMs. This combines to produce 552 HP at a staggering 8700 rpm. 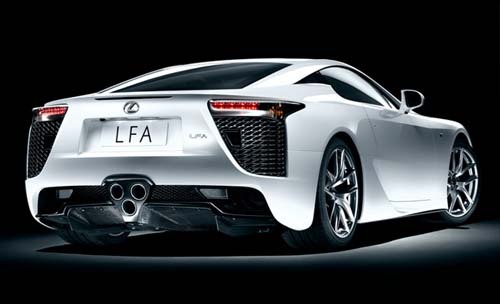 The LFA’s purpose-built V10 delivers 90% of its 354 lb-ft peak torque between 3,700rpm and 9,000rpm. The 4.8-litre V10 engine uses lightweight materials (aluminum alloy, magnesium alloy and titanium alloy) and a very compact size (smaller than a conventional V8) allowing for optimal weight distribution and an exceptional power-to-weight ratio. As you would expect from such a potent vehicle, the engine uses a dry sump oil lubrication system. Independent, electronically controlled throttle bodies ensure precise air-feed to each of the 10 cylinders, enabling immediate engine response from the accelerator pedal. The engine response time is approximately half the normal response time of a single-throttle valve. To reduce weight and improve the vehicle balance Carbon fibre reinforced plastic (CFRP) body panels enhances high body-rigidity and reduces weight. This unique shell is 100kg lighter than a comparable aluminum body. Relatively higher weight components such as the engine and transmission are placed within the wheelbase. Furthermore, optimal placement of the the fuel tank in front of the rear axle adds to the centralized mass. Lighter weight components, like the radiator and electric fans, are placed behind the rear axle. Combined with a front-engine and rear-wheel-drive configuration, the short, wide and low body allows the LFA to achieve its target front-to-rear weight distribution of 48:52.
shift feel. Four selectable driving modes and a seven-stage shift-speed selector that results in upshift speeds down to 0.2 seconds provide a higher level of driver control. Track-sized high-performance (Carbon Ceramic) CCM brake discs and Electronically Controlled Braking system generate ultra-powerful yet stable braking. 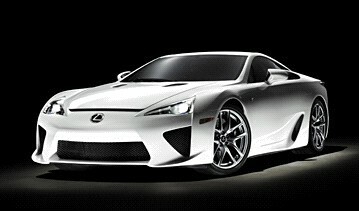 According to Lexus, the LFA will yield 0-100 km/hr times of about 3.6 seconds and top out at 325 kms/hr. If you plan on acquiring one of these spectacular coupes, start sweet talking you local dealer as only 500 units will be made for the Global market up until 2012.